The Amsterdam based design studio Admiraal was established in 2002 and is housed in the NDSM Art City, the largest creative hotspot in Amsterdam with more than 150 designers. Admiral studio designs and produces products, interiors and packaging. For many of his products, owner Robert Admiral drew inspiration from the Amsterdam canals. The pattern of the Amsterdam canals can best be seen from the sky. 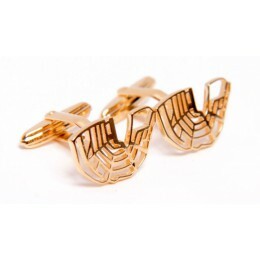 This view provided the inspiration for the remarkable Studio Admiraal cufflinks. 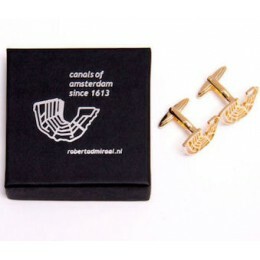 Designer Robert Admiral designed them in honour of the 400th anniversary of the Amsterdam canals (2013). 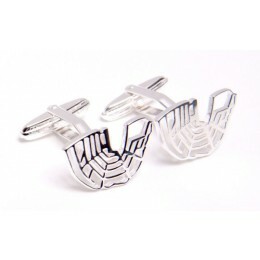 The most characteristic parts of Amsterdam as silver cufflinks: a subtle touch. The Amsterdam canals can immediately be identified on aerial photographs and maps, thanks to the distinctive semi-circular shape of the Herengracht, Keizersgracht and Prinsengracht in the center of the city. This canals were built during the Golden Age (1600-1700), and grew over the centuries into one of the most unique places in the world. The canals became a UNESCO World Heritage site in 1999. At the time, the network of different waterways was made for drainage and reclamation of land in order to expand the city. The canal was built primarily for practical reasons, and the area gradually grew into the picturesque cityscape that defines Amsterdam. Wealthy financiers and merchants invested their money in building houses on the canals. Thus, the Singel, Herengracht, Keizersgracht and Prinsengracht were born. 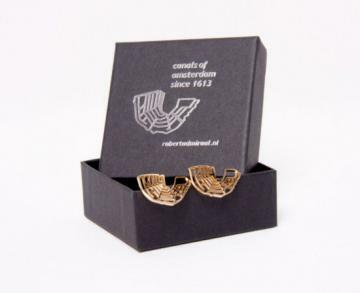 Carry a piece of Amsterdam with the unique cufflinks by Studio Admiraal. Also very suitable as a gift!